It should be no surprise by now that I am a great big nerd. I really am. And I am totally ok with that. I have two little girls that are SUPER into Disney Princesses, and that makes me happy. I love cartoons. I may gag a little on the amount of pink tulle currently in my house, but it's still pretty neat that I can sit down and enjoy a movie with my monsters. 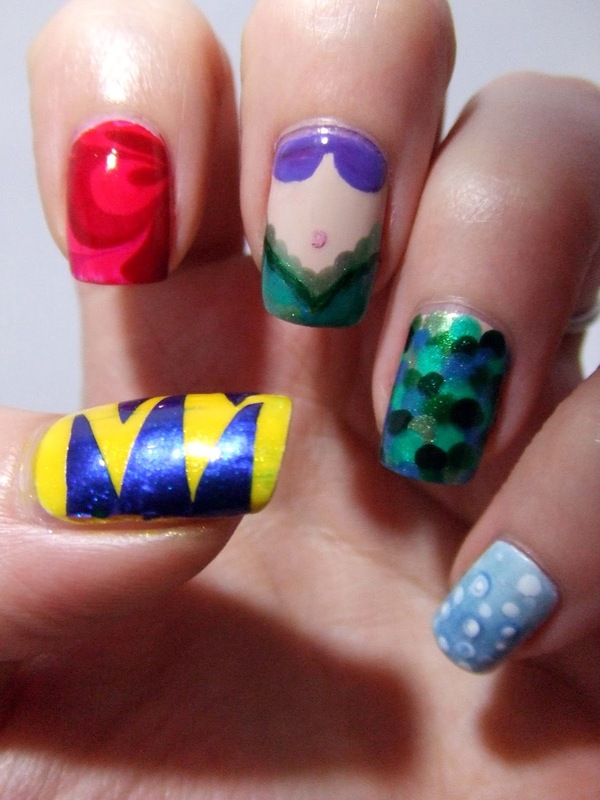 One of my favorites is The Little Mermaid. 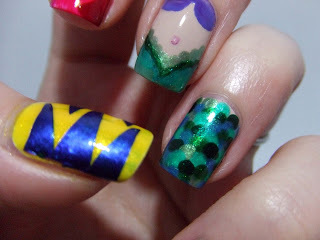 I wanted to be a mermaid when I was a kid. It was my favorite daydream. What a crushing blow it was to realize that mermaids were only fantasy. This might be my most ambitious project yet. I tried two things I had never successfully done before, along with actual artsy painting with brushes. It didn't turn out half bad for super-themey nails. For Ariel's hair, I did a water marble with OPI Malaga Wine, Sally Hansen Xtreme Wear in Red Carpet, and Butter London Pillarbox Red. For her "body" I used Julep in Pippa, Wet'n'Wild On a Trip, Ulta Green with Envy, China Glaze Turned Up Turquoise, and NYC Big Money Frost for the middle and ring fingers. (First attempt at fishscale!) For the pinky, I used NYC Cashmere Creme and Empire State Blue in a gradient. For my thumb, I tried to make decals with Essie Aruba Blue over Sinful Colors Lets Meet. It actually worked pretty well, though I dragged it a bit with the topcoat...and my thumb looks more "wolverine" than Flounder. Oh well. really pleased with how the middle and ring came out. I had never done the fishscale thing before. 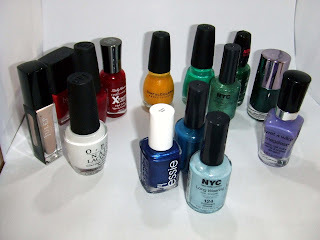 all the polishes I used. It was a big mess, but fun.